Sometimes you want to restrict who can view or edit your Qwilr Pages and with the Permissions settings you'll be able to make those refined decisions. Note: The permissions settings apply only to content creators. Account admins will always be able to view and edit all content. Saved Blocks*: What happens without permission? Qwilr Pages: What happens with "View Only" mode? 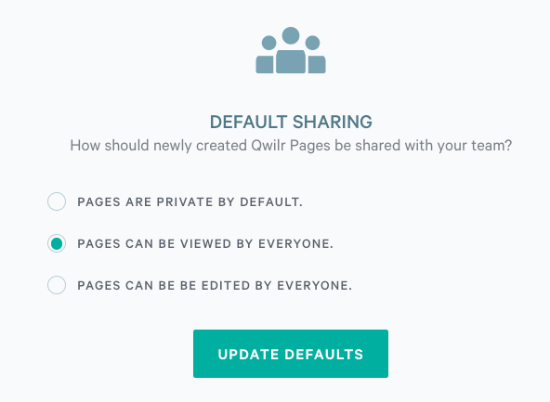 Qwilr Pages: What happens when a Page isn't shared? * Some features are limited to Enterprise plans only. With the permissions feature you'll be able to lock two types of content: Saved Blocks, and whole Qwilr Pages. Who can view or edit is set on a per item basis, though you can set an account-level default. Within your Account Settings ( Settings → All → Account) admins can set the default access level for Qwilr Pages. Pages can be edited by everyone - This means by default all new pages will have edit access shared with all users in the account. This can still be turned off on a per-page basis in the sharing settings. Pages can be viewed by everyone - By default all new Qwilr Pages will have view only access. They'll be visible in everyone's dashboard, but they won't be able to edit unless edit access is specifically granted. Pages are private by default - By default all Qwilr Pages will hidden from other users (other than admins). This can be changed on a per-page basis in the sharing settings. What happens when only admins can edit a saved block? When a block is locked to admins only, anyone in the account can use it, but they won't be able to edit the contents. In the above example, the first saved block is locked, and you'll be able to tell because it has a lock icon and the edit pencil is disabled. The second saved block is editable by all, so the edit option will be present. If a locked block is used on the edit screen you'll see a message that this block is locked. Neither the contents nor any Custom Styles can be edited. 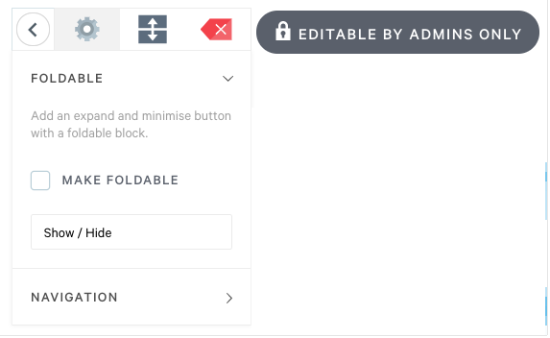 The contents can't be edited, but some block settings are still available, like making the block foldable or deleting it from the Qwilr Page. You'll access those by clicking on the settings button. To share your Qwilr Page with a colleague you'll head to your internal share settings. There are a couple of different ways to reach the setting. From your dashboard you can click on who the page is currently shared with to bring up the settings. From within the edit screen you can click on the internal share icon to bring up those settings. Check the box next to the user that you want to share with and select what they can do. With "Can View" they'll be able to view your Qwilr Page but they cannot edit. With "Can Edit" enabled they'll be able to directly edit your page. When you've given a colleague View access they'll see a message when they view your Qwilr Page. If you've chosen to not share a Qwilr Page with a colleague they won't be able to see your page at all. It won't exist for them unless you shared it. The only exception is if they're an admin. 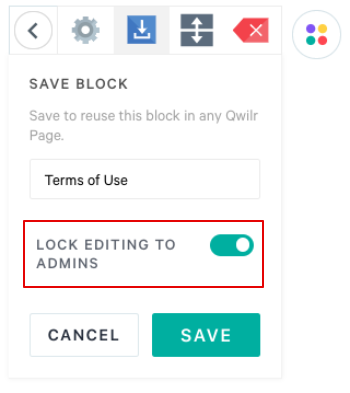 Admins can always view all Qwilr pages in an account. From your Dashboard you'll be able to tell who has access to each Qwilr Page. For example in the above screenshot only "me" (Elizabeth Jennings) has access to the Harvest Travel Plans page. 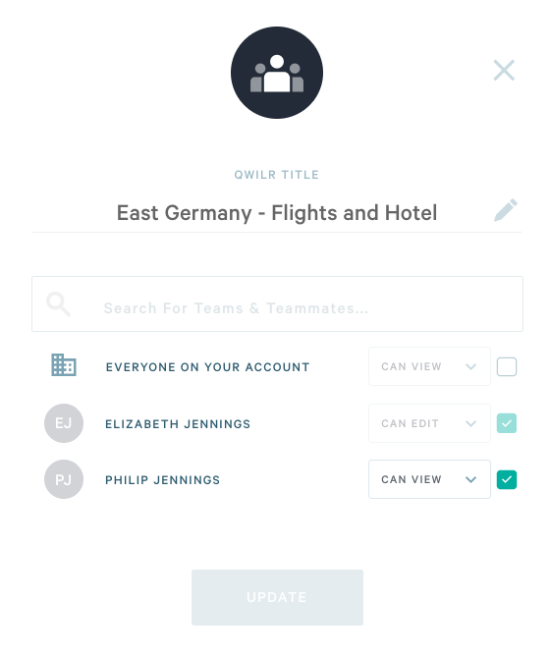 But for "East Germany - Flight and Hotel" two users (Elizabeth Jennings and Philip Jennings). However the account also has a 3rd user (Stavros) who doesn't have access to either page and from his view he won't see either listed in his dashboard.